The only thing I wondered afterward was “Why for God sake was this movie made?“. I’m not saying that this was the most horrible film of the year. Or the most superfluous release ever. There were some positive things in it. And in a certain way, it was sometimes far from bad even. But in the end, it was only a simplistic storyline and little to nothing innovative. The only thing that stayed with me is that you got an unpleasant feeling while watching. The way Rainy (Guillermo Diaz) addressed and dealt with the kidnapped persons was rather intimidating. An agitated character who’s completely out of control after consuming some kind of soft drugs. You just felt that it was a difficult situation for Audrey (Tammy Blanchard) and her daughter Cheyenne (Onata Aprile). But that’s the only thing in this film that can be called exciting. For the rest, it’s quite weak. Everything revolves around the claiming of water rights by Bobby (David Spade). Something his ancient grandfather failed in doing. And apparently, he can only achieve this by sending two vicious-looking characters to the elderly owner. To exert a little pressure. What Bobby didn’t know was that the latter had already died. The only ones they find in the old man’s house are the daughter Audrey and granddaughter Cheyenne. And the only plan that those two bums can come up with is to kidnap these two people who happen to be present. What follows is a precarious situation where one kidnapper (Dwight Henry as Jawari) tries to keep the other in line (clearly that these two bunglers don’t really know each other). And when someone unexpectedly shows up at the door, Ryan gets even more agitated. Apart from the lesser known actors, you will notice a number of familiar faces. The most well-known person is, of course, the comedian David Spade as the go-getter Bobby who apparently has to prove himself towards his grandfather Calvin (Bruce Dern, known face number two). Personally, I don’t think David Spade belongs to the crème de la crème when it comes to comedy. Usually, these are forgettable, nonsense comedies that are far from funny. I thought he’d make a funny comment at any moment. His contribution was reasonably mediocre. Bruce Dern’s acting was also fairly limited. Certainly compared to his part in “The Hateful Eight” as General Sandy Smithers. And finally, you’ll also recognize James Earl Jones in a tiny role as a sort of notary. Also an insignificant role for such a well-known star. A movie to forget about. What remains are the leads. Their acting is nevertheless of a reasonable level. For example, I found the interaction between Tammy Blanchard and Onata Aprile very convincing. Maybe at times, it was a bit overly sentimental and Cheyenne came across as inexperienced. But that didn’t really bother me. Also, the acting of Guillermo Diaz was generally good. He managed to picture Ryan as an unstable character. Although his frantic attempt to sound like an accomplished psychiatrist was a bit absurd. Unfortunately, this wasn’t enough to make it an interesting film. The motive itself was already far-fetched. The final denouement sounded even more nonsensical. 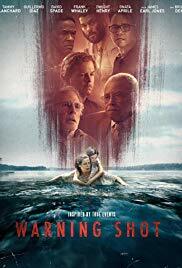 Nope, “Warning Shot” certainly isn’t a great film. So, you don’t want to waste time? Better you skip it then.